The motion of the Blickesnderfer typewheel. 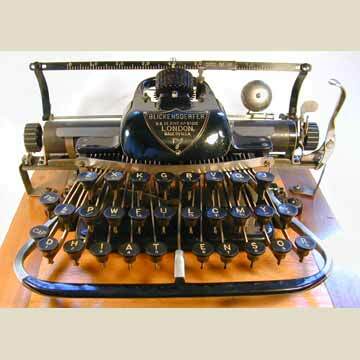 The Model 7, offered in 1897, became the deluxe version of the basic design. Both models evolved with time and were quite popular. This particular example was assembled in Britain and is known as the "London Blick". Picture 5 shows an extremely rare variation: a gold-plated Blickensderfer 7. Picture 6 shows an almost equally rare version: the aluminum Blick 7. All Blickensderfer machines were offered in aluminium versions after 1906, but very few of these were produced. The No. 7 was superceded by the Model 8 in 1908.